The most fun part of quilting for me is making blocks. Just sewing along, block after block. Most of my UFOs have been abandoned in the block stage, and now, when I am trying to finish them up, I can’t remember what the big plan was. Maybe there was no plan. Just blocks. I like the “no sashing” setting very much. These blocks are the same Corn and Beans pattern used in my Harvest Festival quilt, and that quilt is set without sashings. However, if I use the “sashings and cornerstones” setting to pad out the blocks, I will be able to make two quilts measuring approximately 56 x 70 inches, so I have decided to do that. 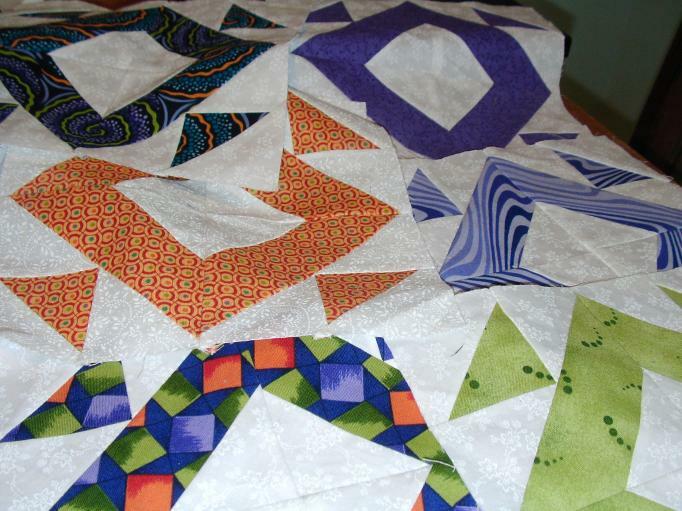 The blocks will be shared out equally, and I’ll have two quilts something like this. Maybe with more borders? I like to end the last round with a dark colour, and I don’t think the binding will be wide enough to qualify. Those aren’t my actual fabrics, of course, or even the actual blocks, but they’ll do for illustration purposes. 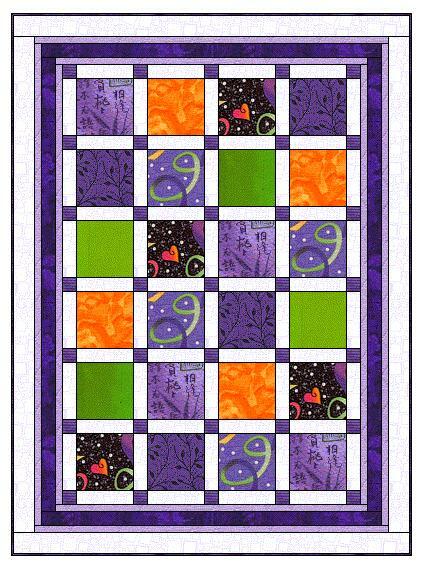 To see what others have on their Design Walls today, please visit Judy Laquidara’s blog, Patchwork Times. I love sewing blocks the most too! I can usually finish the step of sewing the blocks together and then I lose interest in the project and have to force myself to finish borders and quilting. It’s nice that I’m not the only one that feels this way. I’m kind of stuck right now, because I’m not allowing myself to start anymore new projects until I finish some of the UFOs I have, he he he.